Quotes about college life can be inspiring, satirical. or simply entertaining. Some of the best college quotes make students think and analyze the meaning, transforming the quotes into an educational tool. 1. "An investment in knowledge always pays the best interest." The typical meaning of investment is in stocks and bonds. However, Franklin aptly pointed out that investing in yourself is by fair the greatest investment you can make. Education can lead to a better quality of life. During good economic times, a degree usually equates to greater earning potential. 2. "The things taught in schools and colleges are not an education, but the means to an education." More important than any specific facts you may memorize at college is the development of a thirst for knowledge and the skills necessary to learn more in the future. 3. "The aim of the college, for the individual student, is to eliminate the need in his life for the college; the task is to help him become a self-educating man." This quote espouses a similar idea to Emerson's quote. One of the greatest skills a student can take away from college is the skill for problem solving and a love for learning. 4. "No man should escape our universities without knowing how little he knows." J. Robert Oppenheimer, "Father of the atomic bomb"
From the limitless reaches of space to the complex workings of the human body, there is so much still to be discovered. It would be tragic if graduates left college thinking they knew everything. 5. "A mind is a fire to be kindled, not a vessel to be filled." Many students discover their true passions while at college that can lead to fulfillment through job and an undying thirst to learn more. Forever the wise man, Twain aptly explains that life experience is by far the best education you can receive. 7. “College isn't the place to go for ideas." Keller understood that college is a training ground that teaches students how to reach beyond college. If a college does its job properly, then graduates gain the tools to help them to manifest their ideas into reality. 8. "Third Law of Applied Terror - 80% of the final exam will be based on the one lecture you missed and the one book you didn't read. " This quote pokes fun at the stress of exams and finals week. Unfortunately, most students will be able to relate to this helpless feeling. 9. "College is the reward for surviving high school." For many students, college is taken very seriously. 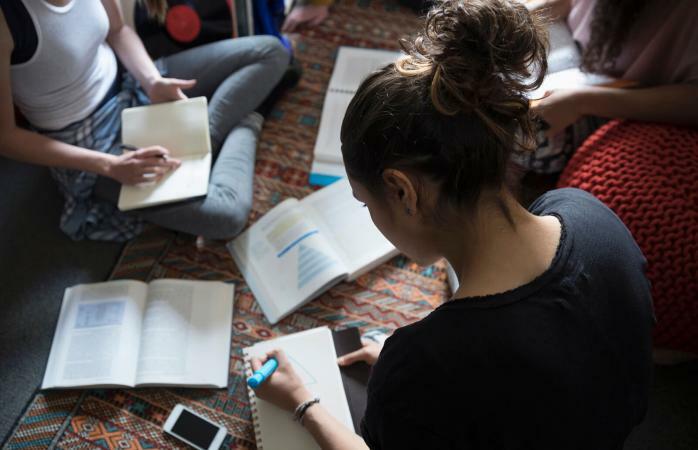 They feel all that hard work in high school as well as the growing pains of teenage years have been rewarded when they step onto a college campus as a first-year student. 10. 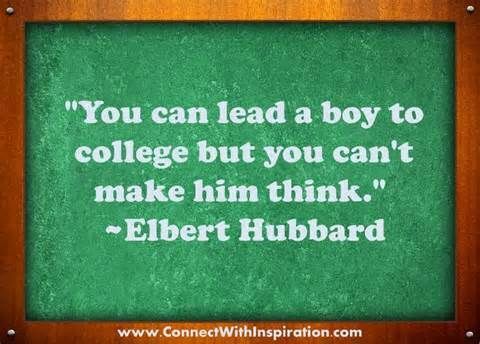 "You can lead a boy to college but you can't make him think." This quote is similar to the proverb, "You can lead a horse to water, but you can't make it drink." Having the opportunity to attend college requires active participation and taking responsibility for learning. If the student isn't interested in learning, there is nothing anyone can do to force that mental interaction. 11. "College inspired me to think differently. It's like no other time in your life." An open mind is an ideal mind for a college education. It can be enlightening and a pivotal point in a student's life. Being introduced to new ideas, philosophies and ways of looking at life should be a major point of a college education. This is a fun quote that gives pause to the contradictory image the comedian paints. It also encourages graduates to value individuality over conformity. The two-edged sword of this quote can be humorous with the way college students act out and do very crazy things. It also has a tragic side where students have died needlessly to hazing. This quote is a wake-up call for all college students. Leave it to a comedian to describe what so many graduate students face--outrageous tuition debt--with a bit of humor. This quote is both funny and sobering in its truth of the burden college tuition can be for college graduates. 15. "The function of education is to teach one to think intensively and to think critically. Intelligence plus character––that is the goal of true education." Dr King understood the value of a college education. The professors' duties are to open minds to view all topics with a 360 degree lens. This means trying on new ideas, philosophies, and subjects and finally arriving at conclusions through critical thinking. This is the epitome of a genuine education.